hey peeps! 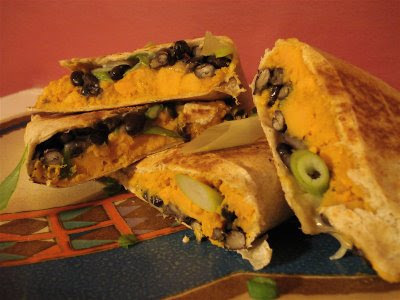 you gotta try my latest recipe: sweet potato quesadillas. boil water. add cubed sweet potatoes and cook until tender (for about 10 minutes, depending on how small the cubes are). drain sweet potatoes and then mash coarsely. mix in turmeric, cumin, chili powder, and salt. heat black beans for about 1 and 1/2 min in microwave. layer sweet potato mash, beans, green onion, and cheese over half of each tortilla. fold tortillas over into half moons. heat a nonstick pan or griddle over medium heat. once hot, spray with non-stick cooking spray. grill quesadillas, turning once, so that each side is golden brown. slice each in half on a cutting board.